Murray Racing :: Miss Scorcher lands Inglis Bonus at Wagga Gold Cup! Miss Scorcher lands Inglis Bonus at Wagga Gold Cup! Miss Scorcher, a two-year-old Fighting Sun filly, proved way too good for her rivals in the $50,000 Inglis Bonus at Wagga on 3 May 2018. In only her third start, she scored an impressive four length victory over her opponents. 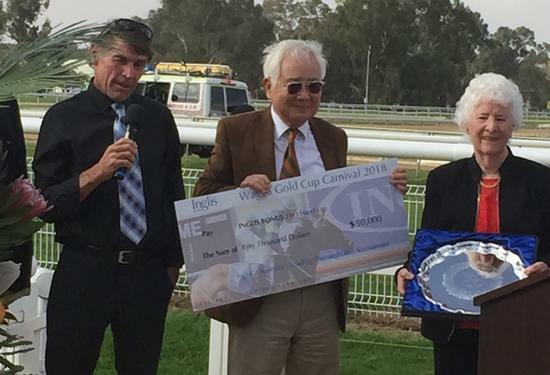 This was a special achievement for the Murray Stables as Bede was always a big supporter of the Wagga Carnival. He had previously won the Inglis Bonus race two times with Chosen Song and Sure and Fast and Paul has also won it with Flash Fibian. So it was fabulous to see Graeme continuing the Murray tradition.